Bling bling is slang for flashy jewelry, according to UrbanDictionary.com. While bling bling is gaudy and glitzy, it can make a party sparkle. If the idea of flashy colors, beads and baubles calls your name, give in and throw a bling bling bash. Ask your guests to wear their favorite chains and ice. Give a prize for the best blinged-out ensemble. Use decoration ideas that reflect your party's sparkly theme. Teen bling is sparkly and colorful. It's impossible to use too many crystal beads or rhinestones, and there is never too much glitter. Glue rhinestones on everything--including the handles of plastic cutlery. Tie large glittery bows to chair backs--alternate pink, lime green and orange bows for a glitzy retro look. Decorate doorways and tables with flexible color-changing LED strip lights or light ropes. Top tables with neon-colored tablecloths. 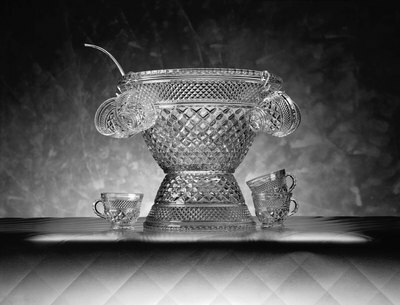 Serve beverages from crystal punch bowls chilled with blinking plastic ice cubes. Light the bowls from beneath with base lights. 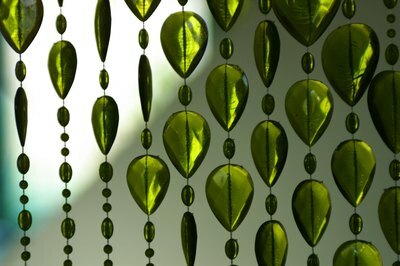 Dress up the ceiling and light fixtures with bunches of Mardi Gras beads. Hang mirrored disco balls. Use glitter pens to design place settings at tables. Children likely will enjoy the novelty of drinking from glow straws in light-up glasses. Pass out glowing bracelets or candy diamond rings as party favors. Scatter glitter and confetti on colorful tables decorated with LED candles--which are safer than real ones around kids--or flashing plasma balls. Pop tiny flashing balloon LEDs into brightly colored balloons; fill them with helium to hover against the ceiling. Use clear glue to add glitter to lightweight ribbons. Tie the ribbons to the balloon stems for even more twinkle. Ask kids to wear as much bling as they can muster to add to the fun. Warning: Bling may include small items that are attractive to children. Such items are easily swallowed. Very young children and bling bling parties are not compatible. Bling is not just for kids or teenage girls. Adults often share the love of glitter, so go ahead and add bling to your elegant dinner affair. Top a white table cloth with a white table runner picked out in silver threads. Use a crystal bowl filled with clear marbles or large crystals--add a handful of battery-powered, white, flashing LED lights. Use all white or silver plates, goblets and tableware. Scatter small crystals and silver glitter or confetti shapes across the tabletop for accents. Float white votive candles in large crystal wine glasses for subtle lighting. Hang crystal and silver strands of beads from chandeliers or light fixtures to catch light and throw sparkles round the room. Use crystal napkin rings. Use place card frames with crystals.